Reading Age of Myth by Michael J. Sullivan made me want to go back (to the future!) and read some more Riyria. 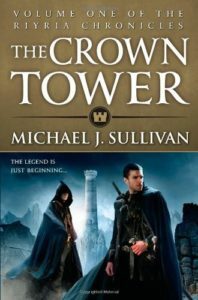 I’ve read the entirety of the Riyria Revelations series, but I hadn’t read any of the standalone Riyria Chronicles yet – starting with this book, The Crown Tower. I don’t have any of the Riyria Revelations books reviewed because I raced through them so fast, so I’m forcing myself to go slower with this series. The Crown Tower is the origin story of Riyria – it tells the story of how Royce and Hadrian first met and their first adventure together – robbing the Patriarch of the Nyphron church. Gwen is also a viewpoint character, and the book covers how she met Royce and Hadrian as well. I don’t remember the minor details of the Riyria Revelations books enough to comment on how much of this story is referenced in them (if at all), but some of the major plot points are definitely foreshadowed. I enjoyed this book. More Royce and Hadrian is never a bad thing, and it was interesting meeting them when they aren’t quite the people I was used to. There isn’t really much of an antagonist – the conflict is just Royce and Hadrian’s intense dislike of each other. There are people after them, but it’s not personal. I was a little disappointed at how little control Royce and Hadrian had over their meeting – they are literally forced together by Arcadius. Gwen displays a little more initiative, but she is also bound by prophecy. I would have been much less sympathetic to how everything happened if I hadn’t read the Riyria Revelations series, so I would definitely recommend reading that series first, starting with Theft of Swords. Now that I’ve reviewed this, I can go ahead and read The Rose and the Thorn!